Craig is the sole proprietor of R Design LLC. Founded in 2007, R Design LLC is a full service graphic design studio specializing in the design of identity and logomarks, print collateral and environmental/signage design. He enjoys creating graphic design solutions for a variety of clients in various industries. Recent projects include an updated wayfinding campus-wide signage program for the University of Denver, interior donor signage program for Margery Reed Hall on the University of Denver campus, a new exterior wayfinding sign program for the Denver Botanic Gardens and the exhibit graphics and signage for the Mark Rothko exhibit at the Denver Art Museum. 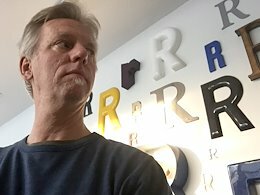 Over the past twenty years, he has been very involved in the Denver design community, serving as past Board Member of the local AIGA Colorado chapter. He is currently an active Board Member and past President of the Design Council, a support group for the Denver Art Museum. As a designer he is fluent in two-dimensional as well as three-dimensional disciplines. Craig’s design strengths are his creative brand/identity work and developing unique environmental graphics and signage programs for his client’s. He enjoy’s collaborating in team environments which result in successfully developed signage systems for clients. Good communication skills keep everyone informed and on the same page. He has designed and managed large, successful campaigns and sign programs for several Fortune 500 companies as well as many local businesses, campuses and cultural institutions. He lives in Lakewood, Colorado with his wife, Carrie and their three year old studio dog, Riley.